Rituals is one of my favorite luxury brands, and their face, body and home products are remarkably affordable without sacrificing any of the luxury. They offer a wide variety of beautiful products from which to choose, and if you are seeking holiday gifts, hostess gifts or stocking stuffers– then Rituals is well worth your consideration. I have reviewed many of their covet-worthy products over the years, and wanted to introduce you to a few of my current favorites. 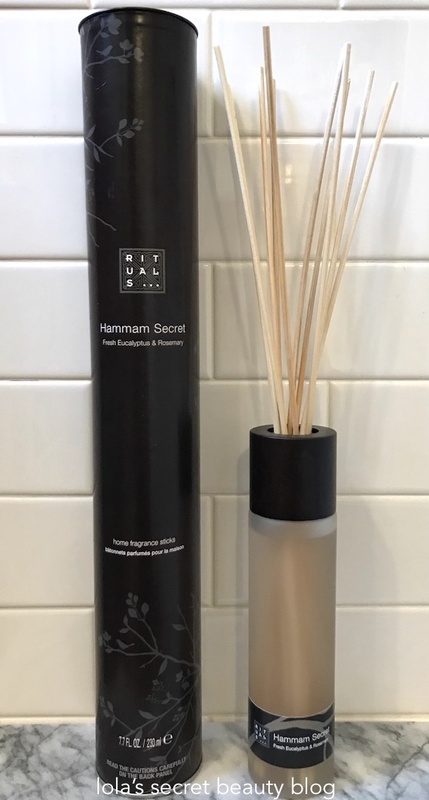 Rituals Hammam Secret Fresh Eucalyptus & Rosemary Home Fragrance Sticks ($39.00 from Rituals and Barneys New York): I have been enjoying reed diffusers from the time that I first noticed them enter the marketplace, but I am so excited that Rituals added them to their collection. Not only is the the glass vessel an exercise in modern minimalism, but the aroma is heavenly. It reads as a warm Rosemary that is both calming and restorative, and each time that I walk into my bathroom the scent gives me a sense of wellbeing. Arrange the elegant, natural sticks in the perfume-filled bottle. This is a formula in which it is not necessary to turn the sticks. If you want to have an extra perfume experience turn the sticks as needed, after this wash your hands with water and soap. Note: if you turn the sticks a lot it is possible that they last shorter than 3 months. Rituals Indian Rose Scented Candle ($35.00 from Rituals and Barneys New York): The moment that I opened the box and smelled this gorgeous candle, it was true love. I love rose scented candles, and this one is really special. The aroma features the pairing of Indian Rose and Sweet Almond Oil, and it is warm, sweet, but not too sweet, and perhaps one of the most lovely roses imagined. The candle combines the gentle fragrance of. the old Ayurvedic ingredients Almond Oil & Indian Rose, for a relaxing effect on body and soul. Enjoy 50 hours of the Indian Rose candle. Rituals Samurai Bath Luxurious Bath Foam ($19.00 for 16.9 oz. from Rituals and Barneys New York): If you love to take bubble baths, or if someone on your holiday gift list does, then this bath foam is sure to delight. It has a clean, fresh aroma that is very pleasant, while the Organic Bamboo and Wakame soften the skin. Furthermore, this formula is enriched with natural extracts that gently clean the skin without stripping it. Directions: pour in a little Samurai Bath as you fill your bath with hot water. Lie back and enjoy the sensation of being engulfed in this rich, creamy foam. Ingredients: Aqua/Water, Sodium Laureth Sulfate, Disodium Laureth Sulfosuccinate, Cocamidopropyl Betaine, Peg-7 Glyceryl Cocoate, Propylene Glycol, Parfum/Fragrance, Glycerin, Sodium Chloride, Bambusa Arundinacea (Bamboo) Stem Extract, Undaria Pinnatifida (Wakame) Extract, Glycine, Buteth-3, Sodium Benzotriazolyl Butylphenol Sulfonate, Alcohol, Tris (Tetramethylhydroxypiperidinol) Citrate, Tributyl Citrate, Citronellol, Sodium Benzoate, Potassium Sorbate, Citric Acid, Ci 42090 (Blue 1), Ci 16035 (Red 40). Rituals Samurai Scrub Face Scrub and Wash in Wake & Bamboo ($15.00 for oz. from Rituals and Barneys New York): This foaming gel with exfoliating particles gently removes dead skin cells leaving skin incredibly soft, smooth and supple. It is unisex, with an ever so slightly masculine aroma, and will be a favorite for men prone to ingrown hairs, but is perfect for anyone looking for a highly effective, gentle exfoliating cleanser that does not sacrifice efficacy. Enriched with the purifying properties of Japanese Wakame, Bamboo and exfoliating scrub particles. Promotes a fresh complexion and a smooth shave. This foaming gel smooths the skin and removes dead skin cells. Helps prevent ingrown hairs. Restores the softness of the skin and leaves it looking refreshed. Suitable for normal and oily skin. Directions: Apply on a damp face and neck, massage using circular movements and rinse with warm water. Ingredients: Aqua/Water, Sodium Laureth Sulfate, Silica, Butylene Glycol, Acrylates Copolymer, Cocamidopropyl Betaine, Sodium Lauroyl Sarcosinate, C12-13 Alkyl Lactate, Phenoxyethanol, Parfum/Fragrance, Panthenol, Aloe Barbadensis (Aloe Vera) Leaf Juice, Stearyl Stearate, Sodium Cocoyl Glutamate, Bambusa Arundinacea (Bamboo) Stem Extract, Undaria Pinnatifida (Wakame) Extract, Tetrasodium Iminodisuccinate, Euphorbia Cerifera (Candelilla) Cera (Wax), Sodium Chloride, Sodium Sulfate, Glycerin, Jojoba Esters, Isopropyl Alcohol, Glycine, Eugenol, Linalool, Limonene, Geraniol, Methylisothiazolinone, Sodium Benzoate, Potassium Sorbate, Sodium Hydroxide, Citric Acid, Ci 77499 (Iron Oxides). Overall Assessment: If you are still trying to find great gifts, for yourself or others, then be sure to have a look at Rituals! The Indian Rose candle is fab! Smells quite strong also, which I like. I love it too! It's such a lovely rose!